Figure 6-7.Flow of oil through the clutch in ENGAGED position. Home > Construction Training Manuals > Construction Mechanic Basic Volume 2 > Figure 6-7.Flow Of Oil Through The Clutch In Engaged Position. Figure 6-7. - Flow of oil through the clutch in ENGAGED position. linkage to the range selector valve assembly on top of the transmission case. Movement of the gearshift lever positions the selector valve to allow main oil pressure to engage the desired clutch assembly. In modern power shift transmissions, the gearshift lever is connected to a range selector valve by hydraulic means. A spool valve (pilot control valve), actuated by the gearshift lever, directs main oil pressure to the range selector valve and causes it to direct main oil pressure to the desired clutch assembly. The hi-lo-shifting lever (on the transmission front cover) is held in position by a poppet lock in the hi-lo shifting housing. To shift from one range to another, the engine must be running and the gearshift lever must be in NEUTRAL position. This allows main oil pressure from the pump to pass through a drilled hole in the pilot valve and through an oil line to the shifter housing. Here it releases the poppet lock to enable shifting. 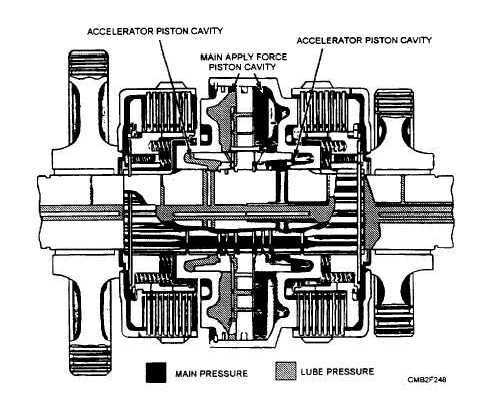 Some power shift transmissions use planetary gearsets to perform the same functions as the transmission just described. A planetary gearset (fig. 6-8) consist of three members - sun gear, ring gear, and a planetary carrier that holds the planetary gears in proper relation with the sun and ring gear. 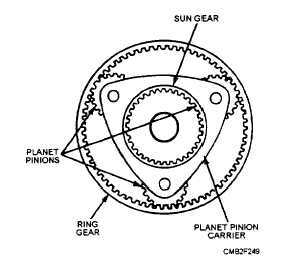 The planetary gears are free to "walk" around the sun gear or inside the ring gear. To cause a reduction or increase in torque, six different methods of connecting this gearset to the power train are possible (fig. 6-9). Direct drive is achieved by locking any two members together. and neutral is obtained by allowing all the gears to turn freely. Figure 6-8. - Planetary gearset.